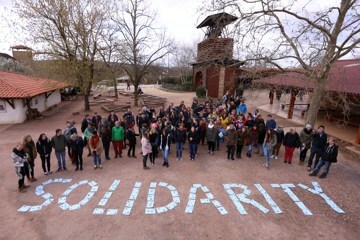 In the context of the international gathering taking place at Taizé from August 9 to 16, a hundred presenters have agreed to lead meetings dealing with a variety of aspects of the search for a "new solidarity." These workshops will be held every afternoon from Monday to Saturday at 3pm, and on Sunday at 2pm. "A Gospel walk": walk and pray in silence on the way to Saint Stephen’s source, with stops before Gospel scenes made out of tree bark by one of the brothers in Kenya. Being the "salt of the earth." How can we respond to this call in today’s societies? God and the universe: the eyes of science and the eyes of faith. 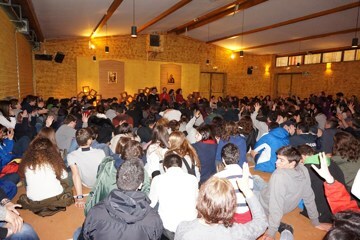 Reflection with a brother of Taizé. "Beauty will save the world." What place and importance does beauty have in our lives? Solidarity without words: a mime production on the topic of interdependence. Being confident and committed in a world where religions coexist. A meeting with Claudio Monge, a Dominican living in Istanbul. Climate change and loss of biodiversity - between emergency and hope. Discussion led by Yunus Omarjee, Eurodeputy (France). Food security, irrigation projects and social emergencies: discovering aid measures for refugees in Chad. How to increase a sense of belonging among countries in Europe? A meeting with Sven Giegold, Eurodeputy (Germany), and Pavel Fischer, diplomat and political adviser (Czech Republic). Facing illness with the spirituality of St. Francis – a meeting with a nun working with people suffering from Parkinson’s disease. Reducing prejudices about poverty – with the help of interactive exercises, discover the prejudices targeting those less fortunate than us. A meeting with Frederic Felicien (Secours Catholique, Caritas France) (in French only). The challenges of Kenyan youth: a stepping stone towards greater solidarity. A meeting with Monalisa Okello. Excluded and discriminated against: Roms in Italy and the path towards their integration. A workshop led by Danilo Giannese, communications officer in an Italian NGO dealing with the rights of Roms. Towards a society where the value of each is recognized – What role do the Churches have in social action? A meeting with Konrad Meyer, from the organization Diaconie Suisse. Is poverty inevitable? What can we do to eradicate it? A meeting with Fintan Farrell and Christine Mahy, from the European fight against poverty network. Taizé in Brazil: a life at the peripheries. A new film on Brother Roger: "Moments in the Life of Brother Roger" (1 hour and 40 min.). For those who understand French or English. A moment for silence and personal prayer with the opportunity to speak with one of the brothers or sisters. The Eucharist: what is the link between this form of Christian celebration and the commitment to solidarity? The human being, created in the image of God: a biblical reflection on Genesis 1, led by a brother of Taizé. Discovering and understanding icons - presentation of the icon of mercy. The Gospel without words: a mime workshop on the story of the prodigal son (Luke 15). Christians and Muslims: living together today. A meeting with Muslims and Christians from various countries. Local solutions to global disorder – and what if change came from me? A meeting with Simon Gouin, a young journalist working on ecological issues (In French only). Innovating for the common good: the rise of social entrepreneurs. Discussion led by Jacques Defourny, professor of economics in Belgium. What if everyone received enough to live on? Discussion on the value of an unconditional basic income paid to each, with Sascha Liebermann and Thomas Loer, two German sociologists commited to the issue. "Go to the outskirts": how this call of Pope Francis invites us to build a Church which is poor and for the poor? A discussion with Latin American young people and Father Mariano Puga of Santiago, Chile. How can the media contribute to a more just society? A meeting with journalists Harald Schumann (Germany) and António Marujo (Portugal). More justice for migrants: a meeting with Amaya Valcarcel, a lawyer engaged in international refugee law and working with the Jesuit Refugee Service. What is the role of Christians in politics? A meeting with György Hölvényi and Jürgen Klute, Hungarian and German politicians. Living with an illness, moving forward, accepting it: a meeting with the group "On the 3rd day", a group of Portuguese Christians that accompany those who are ill.
Escaping addiction and prostitution is possible! A meeting with the "Mouvement du Nid", an association involved in combatting prostitution. A nun on the bus : When faith travels the United States by bus to promote social reforms ... meeting with Sister Simone Campbell, president of the Network. Daring to create relationships and bridge differences, building a world of fraternity and solidarity – a meeting with people with or without disabilities from the l’Arche Community of Jean Vanier. Taizé in South Korea: a fraternity involved in various aspects of Korean society. God is at work in us - How can we discover his call? “Between us and you there is a great gulf” (Luke 16:26): Can the rich be saved? Being a resister where there’s social injustice, prejudice and pressure - reflection, exercises and sharing. When theatre is just the beginning... Meeting with a theatre troupe from Romania, discovering how theatre can foster social integration (with practical exercises). Climate change and loss of biodiversity : between emergency and hope. Discussion led by a scientist, both Christian and concerned. In families, in business – are we showing enough confidence to young people and those who lack experience? Different perspectives from business leaders and parents, with Stephanie and Arnaud Guirouvet and members of "Christian entrepreneurs and managers". What renewal is happening in the Church today? Meeting with Cardinal Manuel Clemente, Patriarch of Lisbon. How to achieve greater justice in commercial trade between the continents? A meeting with Nicolas Van Nuffel, from the National Center for Development and Cooperation (Belgium). "Blessed are the thirsty for they will find justice": a personal reading of the beatitude by a Polish judge. The sacramentality of welcoming the stranger: protecting migrants, refugees and preventing human trafficking. A meeting with John Klink of the International Catholic Commission for Migration. "Take care of the vulnerability of peoples and individuals." Members of the European Parliament react to the call of Pope Francis. What leads us to life? When performers, activists and thinkers work together for life... a global mission. How to promote peace? Meeting with Donatus Köck, Assistant Secretary of the Ministry of Foreign Affairs and European Integration (Austria) and Nadezda Mojsilovic, head of the ecumenical project "Let’s walk together" of the Serbian Orthodox Church and Pavel Fischer, diplomatic and political advisor (Czech Republic). Power, relationships, justice: an introduction to church ministry and grassroots community organising. 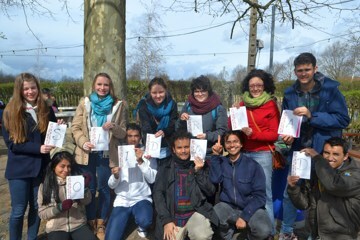 A workshop led by young people from the UK. How to support people in difficulty? Reflection and exchange. "I gave you an example..." A biblical reflection on the washing of feet (John 13), led by a brother of Taizé. Reinact the parable of the Good Samaritan in pantomime (for a limited number of participants - tickets available in La Morada). Whose home is planet Earth? Living in solidarity with God’s creation. Discussion led by Reverend Dave Bookless, a theologian from A Rocha International, an association working for the safeguard of creation. Having the poor at the center of Church life: discover experiences of fraternity from the area around Taizé (in French and Spanish). The Gospel and African cultures: what can the experience in Africa of the proclamation of the Gospel teach the universal Church? Meeting with Cardinal Laurent Monsengwo Pasinya, archbishop of Kinshasa. Eating healthy and enough – What to do so that all may access this right? A meeting with Germain Da Sylva, a senior official from the Food and Agriculture Organization of the United Nations. Is a city of peace possible? How to build a city that promotes human dignity? A meeting with Maurizio Tira, urban planner from Italy. How are the poor included in the economic policies of the European Union? Meeting with Elena Flores, an economist with the European Commission. How to live together despite the current threats in our world? Discussion with Aloiz Peterle, Eurodeputy (Slovenia), Pavel Fischer, diplomat (Czech Republic), Jean-Claude Mallet, senior official in the Ministry of Defense (France). ʺI am because you are.ʺ Giving young people living at the outskirts a taste for engaging and getting involved in social transformation. Discover the Ubuntu Academy in Portugal. Taizé in Bangladesh: solidarity and dialogue in a country where Christians are a tiny minority. “Between us and you there is a great gulf” (Luke 16:26). Can the rich be saved? “What should I do to have eternal life?” A biblical reflection on the parable of the Good Samaritan (Luke 10), led by a brother of Taizé. When music becomes resistance... Listening to the pianist Miguel Ángel Estrella, Argentinian Ambassador to UNESCO. The salt of the earth: discover the work of the Brazilian photographer Sebastiao Salgado, with a film by Wim Wenders and Juliano Ribeiro Salgado (in French only). The encounter between Christianity and the traditions of the East. A meeting with Javier Melloni, Jesuit priest (Catalonia) and Keiji Utebi, pastor and professor at Kwansei Gakuin University (Japan). Christians and Muslims: living together today. Meeting with Muslim and Christians from various countries. A thermometer in the pulpit? Climate change and Christian faith. A meeting with Martin Kopp, a young Protestant theologian. Money well spent: discovering a bank that finances solidarity projects. A meeting with Kreso Prevendar and Radovan Librić, founders of an ethical bank in Croatia. How can the Churches renew themselves ? How have they renewed themselves in the past? Discussion with Alberto Melloni, historian and specialist on the Second Vatican Council, together with a brother of Taizé. Act and pray for the tortured with “Action by Christians for the abolition of torture”. How are the poor included in the economic policies of the European Union? A meeting with Elena Flores, an economist with the European Commission. The fight against tax havens : what Europe can do. A meeting with Eurodeputies Sven Giegold (Germany) and Philippe Lamberts (Belgium). Taizé in Kenya: brothers of Taizé pursue a path of brotherhood in Nairobi. A new film on Brother Roger: “Moments in the Life of Brother Roger” (1 hour and 40 min.). For those who understand French or English. Is spiritual solidarity between Muslims and Christians possible? The experience of the Adyan Foundation in Lebanon. Understanding debt: between economics and theology. Discussion led by a brother of Taizé and Philippe Lamberts, Eurodeputy. Is solidarity compatible with the laws of the marketplace? Meeting with Nereo Tiso, teacher and philosopher (Italy). Listening to the poorest in order to weave strands of brotherhood – a meeting with the Sappel community (France) that brings together Christians from diverse social origins. Guess what? The news isn’t all that bad. Discussion with Christoph Benn, from the Global Fund to Fight AIDS, Tuberculosis and Malaria. The right to adequate housing: a discussion with a Christian couple about their commitment to better housing for people living in poverty. Excluded and discriminated against: Roms in Italy and the path towards their integration. Workshop led by Danilo Giannese, communications officer in an Italian NGO dealing with the rights of Roms. Daring to create relationships and bridge differences, building a world of fraternity and solidarity – a meeting with Jean Vanier and people with or without disabilities from the l’Arche Community. Towards a society where the value of each is recognized: what role do the Churches have in social action? A meeting with Konrad Meyer, from the organization Diaconie Suisse and Jürgen Klute, German politician. Apocalypse Man: a mime interpretation of Béla Bartók’s Sonata for solo violin. Towards a common horizon of religions? A meeting with Javier Melloni, Jesuit priest (Catalonia). Should Christians support economic "degrowth"? Discussion on ecology and Christian faith with Martin Kopp, a young Protestant theologian. Tour de France in tandem on the lookout for new solidarities: discovering creative (and athletic) ways of putting into practice Brother Alois’ call for 2015.